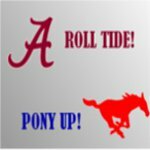 PonyFans.com • View topic - College football game attendance on the decline, but why? Too little game play for the amount of time. Ironically, the faster paced offenses lead to more commercials and make the game more boring. I think it has to do with entertainment fatigue as stay-at-home options continue to increase. The answer lies with the Yoda, Cliff Kingsbury. This new generation of youth can’t focus for more than 30 minutes. Plus, they have more options than ever to watch it on TV, TiVo, smartphones etc. Why battle traffic, parking, heat, rain, cold when you can watch in thr comfort of your home, play Xbox and tweet at the same time? I’m worried TV blackouts will reappear -only the big games are “standing room only” in the SEC now. Best thing to probably happen being that the younger generation isn't as interested. I know a lot of stadiums would fill up again. When you think of it over exposure of anything ruins it for all. I think that's an old marketing -ism. NavyCrimson wrote: Best thing to probably happen being that the younger generation isn't as interested. I know a lot of stadiums would fill up again. I agree that the younger generation is not as interested. Many factors involved: 500,000 fewer kids playing organized football since 2008; time involved ( reportedly in NFL you only get 8 1/2 minutes of actual play time if you calculate from the second the ball is snapped until play is blown dead ) games too drawn out with TV, video, commercials...etc. ; younger people cannot focus for more than 20 minutes and games become boring as everyone on cell phones playing games, texting....etc. ; cost as tickets, parking, concessions become expensive; TV gives better views, multiple replays...etc. and finally the younger generation is deeply into fantasy games particularly the NFL and are hugely involved knowing the players and analytics more than any preceding generation, however, their interest is not attending live games rather the resulting stats from a large number of games involving their fantasy games. This also affects team loyalty and little interest in wasting time attending a single live game. Good point. Lack of team loyalty is an interesting phenomenon. For instance, yesterday I talked to two Dallas guys at work, two guys who grew up here. One was a Redskins fan and another a Spurs fan. I’d gotten the crap beat out of me on the playground if I ever dared to do such a thing. Heck, my own mother would have whipped me. And what’s up with calling your own team “they”? It’s WE. Or OUR team. That’s a related and new phenomenon. Looking at attendance from 2017, doesn’t look like soccer is ever going to help fund an athletic department.